Craig Ferguson is talking once again, but just because the sun’s up doesn’t mean the conversation’s PG. The quick-witted, always garrulous host of CBS’s “The Late, Late Show” lends his voice to Disney/Pixar’s latest computer animated effort “Brave,” playing a testy Scottish lord, but Ferguson wasn’t censoring his own comments to be more kiddie-friendly when he sat down with PopcornBiz to discuss everything from his new film role to his late night show to how the people of Scotland react to him to how he tries not to be a d***. How often did you hear in your early Hollywood career that you should get rid of the Scottish accent? Every day. I heard it every day, and then later on you hear from the same people, or indirectly, 'You're only funny because of your accent.' It's a bit of both. You hear it, but I was never capable of doing it anyway. Although, there's a certain feeling amongst certain people in Scotland that I don't even sound Scottish anymore. I think that'd be news to most Americans. A young woman named Merida defies tradition by pursuing her love of archery, inadvertently bringing a curse upon her land the threatens her father's rule. Features the voices of elly MacDonald, Emma Thompson, Billy Connolly, Craig Ferguson and Robbie Coltrane. You recently took your show to Scotland. How do they react to you there, as someone who's gone to Hollywood and gotten successful and famous? Are they skeptical of you, or do they give you a grand reception? All flavors of that – all variations of the above. Some people are nice. Some people have no idea who you are and what you do. Some people are interested. Some people are not interested. Some people are resentful. It's a broad cross-section, really. I don't think there's any great uniformity of feeling. If there is anything it's a mild interest that someone from the neighborhood did well. 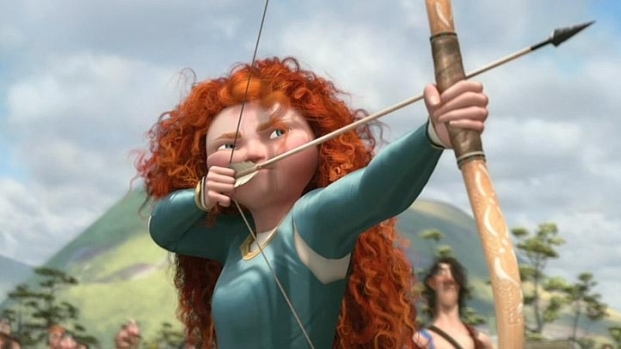 'Brave' largely avoids all the long-held Scottish stereotypes, but how do you feel about those tropes? And do you have a sense of how, nationally, Americans generally think of the Scottish? It's not a particularly American thing to get it wrong about another country. You can listen to people in Britain…One of my favorite ones was here when an actor on my show said, 'The thing is, Craig, Americans have no sense of irony.' My head writer, who's still my head writer, Ted Mulkerin, says, 'That's very interesting coming from a people that call themselves GREAT Britain.' I think people have misconceptions about what they don't know very well and that's normal. If you don't know something very well you kind of imagine what it'd be like. The more you know about it I think the more interesting it is. America is an extremely diverse place. I don't think there's such a thing like one American thing anymore, if there even ever was. I think that's a myth. 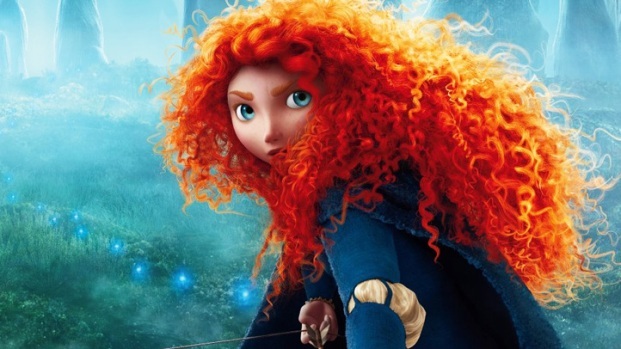 Kelly Macdonald, Craig Ferguson and Kevin McKidd give their takes on the depiction of Scotland in "Brave," and why it matters that the protagonist is female. In theaters June 22. With all your varied creative interests and talents, how tough is sticking to the daily schedule of your show and not being able to run away and do a movie for a few months, or another project like that? Well, it's made easy by the fact of the way that I live my life in the sense that I'm involved in a family. I have a wife and children. My desire to leave town is curtailed because I want to be with them. One of the reasons I pursued the late night job so aggressively in order to get it was so that I'd be able to be in town for my family. At that time it was only one kid, but still, I wanted to be here for him. That's why I went after that job. I didn't want the nomadic life of a movie actor. Television actors do well. They stay here and do the same thing. They don't have to travel. I was just done with it. I still go out and do standup tours. I do two or three a year, and you kind of work out your jones for it then. But I like hanging around with my folks. How does doing the standup tour help you when you go back to the show? It does seem to energize the show in some way. I think that it gives you a sense of who's watching the show. I meet people who are watching the show when I go out and meet the audiences – they're the people who watch the show. So I get to see that and that's interesting and I get to connect with them in their town, which is also interesting. We get to have more of a raucous party than the law would allow on television, which is also fun. But I don't know how they inform one another. They're different animals. Doing the show, I'm as happy doing that and as relaxed as I am sitting here talking to you. There's no adrenaline rush. Your shows feels organic, like it just goes the way that it goes on any given day. We hear a host like David Letterman breaks his show down every day, very sharply analyzes and critiques it and tries to find ways to improve. When you're doing a show as frequently as you're doing, how do you find your own creative satisfaction there? It's really in the moment – that's where I find it. Dave's technique…Dave is a comic genius. Dave's technique of doing the show, I think sometimes, particularly in your early days, if you want to do a good job you emulate the techniques of other people who have done the job previously. If I was a painter I would emulate the works of Picasso in the beginning in order to try and find a way into the process myself. At the beginning, I did all of that. I watched my own show, but that's not how I do it. How I do it is that I don't like to prepare. For me the gold is in the errors, the mistakes. The humanity is in the failure, and also it's funny. It's inevitable that you get a Hollywood douche-bag on your show every so often. How do you deal with that? That's a good question, because I never have to deal with it because I never get to see it. Even the worst douche-bag isn't stupid enough to walk out and be a douche-bag to ME. I'll slice them and dice them, but when people behave badly, and it's not as often as you would think, it really is quite a rare occurrence. But when people behave badly we just don't have them back. Have you ever had those Larry Sanders-esque moments, where the minute the camera stops the person across from you turns into a completely different person? Stan has some unresolved issues! What do you like about having Stan on and playing out your TV rivalry? Stan is great. Stan genuinely is confident in his own talent and secure in his legacy, enjoys his success and is a cranky, old motherf***er. I enjoy all that. That's all fun. Have you ever come up dry on the show? Yeah, sometimes, but it doesn't last that long. It might happen tonight, and then we'll make a thing of it. I'll ask for some music. Is there anyone from the long history of television that you see yourself as the contemporary version of? Well, there are certainly people who have influenced what I do. People that I'm consciously aware of, I'd say the two biggest ones would be Regis Philbin and Pee-Wee Herman. That would be my two strongest TV influences. Pee-Wee for the sense of the absurd and the delight of the absurd in television, and Regis for the ability to just keep talking, extraordinary ability to keep talking.